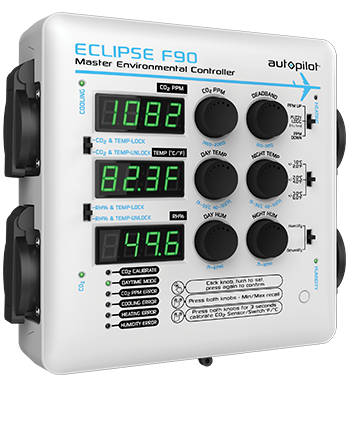 The Autopilot ECLIPSE F90 Master Environmental Controller allows growers to precisely control and monitor temperature, humidity, and CO2 from one centralized unit. Its three digital screens continuous display current temperature, relative humidity, and CO2 levels. LED lights indicate active modes and inform the user of any errors. The ECLIPSE F90's modern and eye-pleasing enclosure features four separate power outlets for external devices: Cooling, Heating, Humidify/Dehumidify, and CO2 ppm. All four outlets feature heavy duty protective covers that prevent atmospheric moisture from entering the device through any unused outlets. A built-in data logger records minimum and maximum temperature, humidity and CO2 ppm levels. It’s also equipped with an optional high temp shutdown feature for use with CO2 generators that is designed to save a crop in the event of an exhaust fan or AC failure. This mode allows the user to set an emergency temperature limit that will turn off the CO2 generator until the grow room temperature is reduced by 10°F. The Eclipse F90’s sensitive and intelligent remote combination probe features a highly accurate temp/humidity and low-drift dual beam CO2 sensor. The probe can be placed up to 15 feet from the controller, and has been designed to resist EMI/EFI from electronic ballasts. 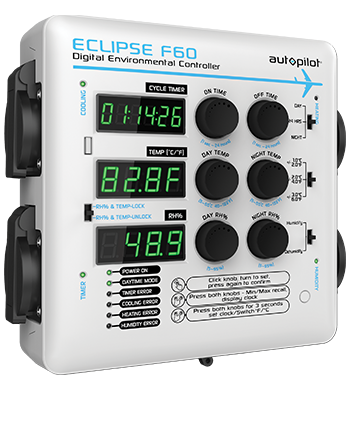 The Autopilot ECLIPSE F60 Digital Environmental Controller combines precise temperature and humidity control along with cycle timing to create an intelligent yet easy-to-use unit. Three digital screens continuously display current temperature, relative humidity, and a cycle timing countdown clock. 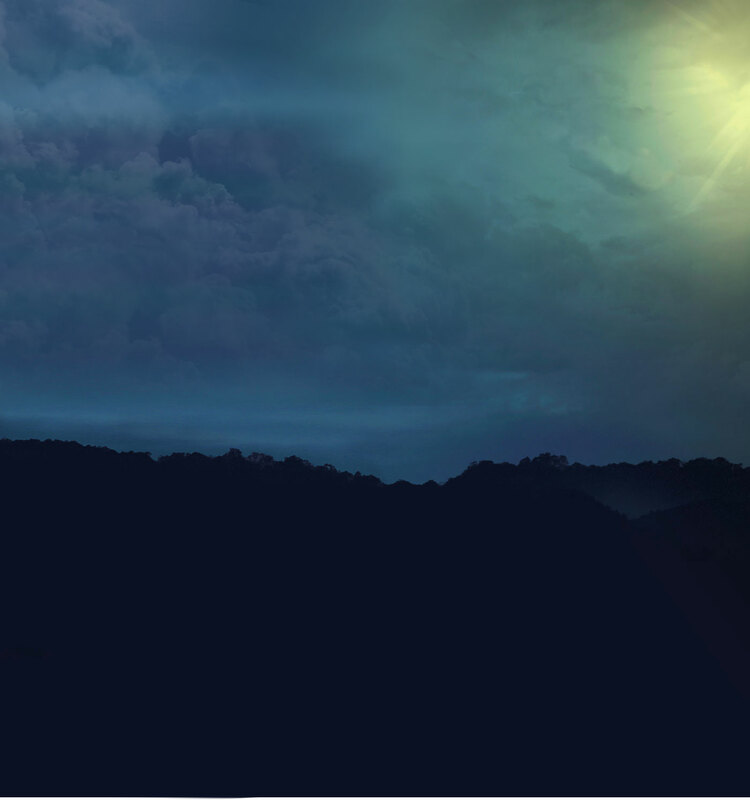 LED lights indicate active modes and inform the user of any errors. Eclipse F60 has four outlets: Cooling, Heating, Humidify/Dehumidify, Cycle Timer. 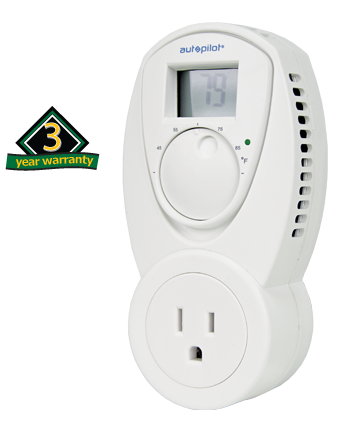 The three temperature and humidity outlets offer customizable day and night set points while the cycle timer outlet controls any device requiring a repeated on/off function during a 24 hour time period. All four outlets feature heavy duty protective covers that prevent atmospheric moisture from entering the device. A built-in data logger records minimum and maximum temperature and humidity levels. The F60’s sensitive and intelligent remote combination probe features a highly accurate temperature/humidity sensor and photocell for daylight detection. The probe can be placed up to 15 feet from the controller, and has been designed to resist EMI/EFI from electronic ballasts. 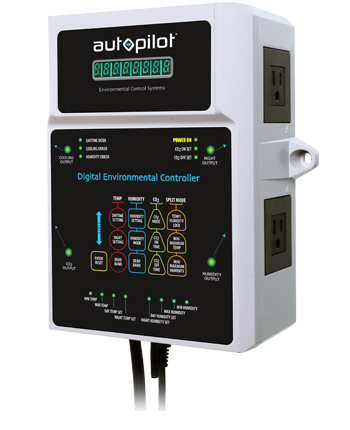 The Autopilot Digital Environmental Controller or DEC (APCETHD) precisely controls temperature and humidity within your grow area. The DEC coordinates the use of supplemental CO2 injection within the temperature function. 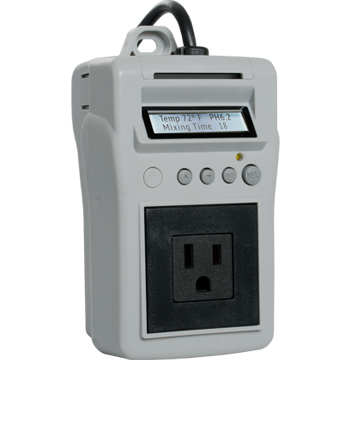 The DEC has four outlets and a 15' remote combination probe with highly accurate temperature, humidity, and light sensors. Easy-to-use push button functions are identified on a large digital display. Built-in data logger records minimum and maximum temperature and humidity levels. 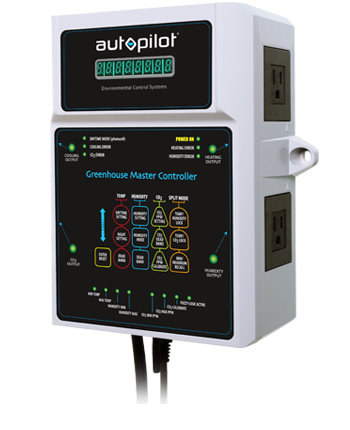 The Autopilot Greenhouse Master Controller or GMC (APCECOTH) is designed to precisely control temperature, humidity, and CO2 in the growing area. The GMC’s enclosure features four separate power outlets used to connect external devices such as fans, CO2 injectors, air conditioners, and dehumidifiers. Each external device easily connects to the unit creating a simple and user friendly platform. The GMC’s remote combination probe features a highly accurate dual beam CO2 sensor. The remote sensor can be placed up to 15 feet from the controller and has been designed to resist EMI / EFI from electronic ballasts. Each unit has been preprogrammed with factory recommended settings for quick plug and play operation. 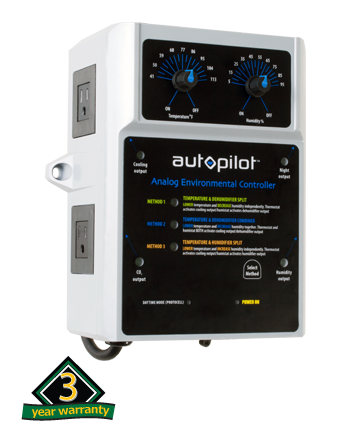 Autopilot controllers offer simple grow room guidance. Control the temperature and humidity within your growing environment, the adjustable temperature and humidity mode for independent or synchronized control. Night device outlet operates when the lights are off, while the built-in photo-cell ensures that your CO2 device only activates when the lights are on. 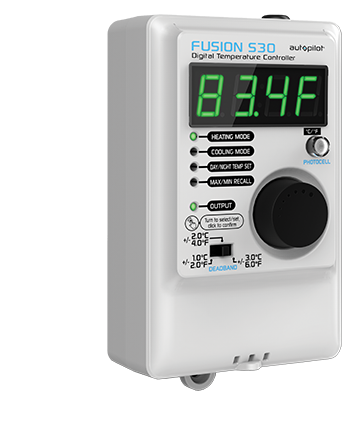 The Autopilot FUSION S30 Digital Temperature Controller can be used with equal effectiveness as a cooling or heating thermostatic controller. Select Cooling Mode or Heating Mode with a simple click and turn of the unit’s dial, then adjust the controller to enter the preferred temperature setting. Once a device is plugged into the controller, the FUSION F30 will take complete control of the device and operate off the programmed settings. Growers can program different day and night temperature settings, which will be automatically switched to the correct mode by the unit’s built-in photocell. Temperature is precisely measured by the unit’s attached sensor probe with 15' cable. The dial adjusts the settings and also provides a quick visual confirmation of the current set points with a simple press. The large digital display makes it easy to see current temperature, even from some distance. After selecting the desired pH setting from 5.0 to 8.0 pH, the pH controller measures the pH value of the solution and automatically adds pH adjustment (either acid or alkalai) to change the liquid's pH to the selected level. The pH controller includes a chemically resistant low voltage dosing pump, and both pH, and temperature sensors. Features include a digital display, adjustable dosing time, adjustable mixing time, adjustable pH dead band, maximum number of dosing cycles, pH high and low limits, and a data logger which shows the minimum and maximum pH recorded. Never before has there been a pH controller with these features for this value. Get automated, get Autopilot! The Autopilot Cooling Thermostat is a compact and easy-to-use controller for air conditioners and exhaust fans. Simply plug it into a power receptacle and then plug your cooling device into its outlet, then choose your preferred room temperature setpoint with the rotary knob. When its built-in sensor senses that the room temperature has exceeded the setpoint by at least 1°F, it will automatically activate your cooling device by powering the outlet. Digital screen displays current room temperature. Its green LED light illuminates when the outlet is activated to on. When the temperature in the room has dropped at least 1°F, the Autopilot Cooling Thermostat will cut power to the cooling device. It has a built-in 1-degree deadband and is ETL-listed. Max power handling 15A. The Autopilot Dehumidifying Humidistat is a compact and easy-to-use controller for dehumidifiers and exhaust fans. Simply plug it into a power receptacle and then plug your dehumidifying device into its outlet, then choose your preferred relative humidity (RH) setpoint with the rotary knob. When its built-in sensor senses that the RH has exceeded the setpoint by at least 1%, it will automatically activate your dehumidifying device by powering the outlet. Its green LED light illuminates when the outlet is activated to on. When the RH in the room has dropped at least 1%, the Autopilot Dehumidifying Humidistat will cut power to the dehumidifying device. Digital screen displays current in room relative humidity. It has a built-in 1% RH deadband and is ETL-listed. Max power handling 15A. Hydrofarm offers a complete line of hydroponic products to complement our Autopilot brand. Click here to find preferred retailers that carry Autopilot products.